The challenge of finding the right combination of metals, diamonds, gemstones, and setting is challenging for any bride or groom. Many jewelers recommend that buyers keep the metal and stone in the same color family. For example, yellow gold dramatically captures the luminescence of a yellow diamond. Similarly, a chocolate-colored diamond in a yellow gold setting generates a warm, luxurious feel. Complementary colors can also create an unexpected effect, such as a rose gold setting matched with a green gemstone. As for dresses, fashion insiders predict that the era of the snow-white wedding gown will gradually recede as brides take chances on muslin and tea-stained colored gowns. Silver palettes are also on the rise for wedding dresses as brides seek the dramatic sparkle that recalls fabric styles of the 1920s and 30s. Also popular are platinum silks, fern-colored green tones, blushing pinks, icy lavenders, and more. With all the options nowadays, it is important that brides-to-be attempt to navigate the line between tradition and trend (a cabernet-colored gown may be a regrettable choice). While it might be refreshing for guests to see a palette of shimmery pastels during the wedding ceremony, some brides may be purists at heart and realize that like all things en vogue, trends do come and go. In addition to new wedding dress and diamond styles, pre-owned stones may be another appealing path. Stunning pre-owned diamonds, emeralds, rubies, and more are available for purchase at most major jewelers and at auctions. In fact, many jewelers have made a successful business of reworking antique jewelry for the modern bride and groom. Both Hamilton Jewelers of Princeton and Brilliant Earth pride themselves in going above and beyond the current industry standards to offer Beyond Conflict Free Diamonds that “have been selected for their ethical and environmentally sustainable origins.” The diamonds are sourced from particular mine operations or countries that maintain their commitment to internationally-recognized labor, environmental, and trade standards. These countries include (but are not limited to) Russia, Canada, and Botswana Sort. As far as mining practices and standards are concerned, Beyond Conflict Free does not finance rebel movements, protects against human rights abuses, minimizes environmental degradation, maintains safe and responsible labor practices, and supports community development (www.brilliantearth.com/conflict-free-diamonds). 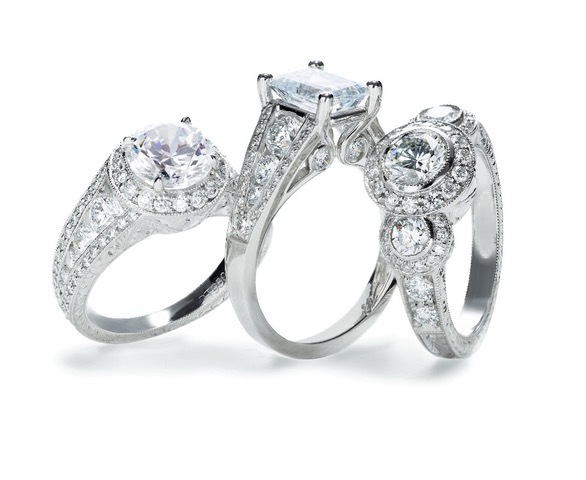 Simms Jewelers of Bedminster also points out that U.S. retailers of fine jewelry are somewhat protected from engaging in the sale of Conflict Diamonds because of the Clean Diamond Trade Act (2003), implemented the Kimberly Process Certification Scheme. The Kimberly process standardizes the certification among diamond exporting countries, thereby creating common language, transparency, auditing, and monitoring of diamond exportation. The act requires that all diamonds imported to the U.S. or exported from the U.S. have a Kimberley Process Certificate. The act aims to prohibit the importation of diamonds whose mining fuels conflict in the country of origin. Among its many styles, Simms is now featuring a show-stopping 18K white gold ring with 75 diamonds (rounds and emerald cuts) totaling over 6 carats. The ring expands and will fit a size 6 to 7.5 finger. Is there such a thing as a 100 percent authentic diamond created in a lab? Look no further than Santa Clara, Calif.-based startup Diamond Foundry (www.diamondfoundry.com). Backed by over a dozen wealthy investors including actor Leonardo DiCaprio, Diamond Foundry is able to “grow” new diamonds by taking a culture of an original diamond and heating to temperatures of 10,000 degrees Fahrenheit (similar to the temperature of the sun). These layers of crystal are stacked, one on top of the other, until a pure diamond is formed. The largest diamond generated in the lab so far weighed in at 12 carats. Diamond Foundry currently produces 1,000 carats per month, which is approximately 150 to 300 gems from every two-week batch. Natural diamonds are rated and tested for purity and authenticity by the GIA (Gemological Institute of America). Color, cut, clarity, and carat weight are examined by a GIA-trained gemologist. 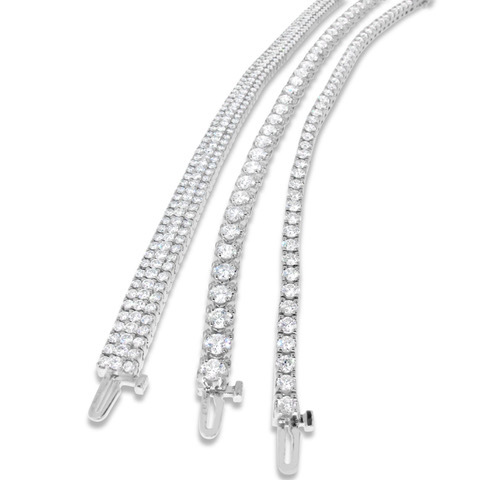 Diamond Foundry founder Martin Roscheisen assures that Diamond Foundry’s products have tested as true, pure jewelry white diamonds. So how does the cost of a man-made diamond compare to those dug out of the earth? According to Diamond Foundry’s website, their lab-grown gemstones have an online price set at 10-15 percent below market price. An individual diamond from their online store costs from $305 for a 0.38 carat round-cut gem to $23,000 for a 2.30 carat gem. In addition to Roscheisen, the masterminds behind Diamond Foundry are largely engineers from Stanford, Princeton, and MIT. Since its launch in 2015, the company appears to be perfecting its foundry process, productivity, and retail potential as it has made an effort to collaborate with a wide variety of diamond cutters and designers. Its “Real. Unique. World Positive” website slogan is accompanied by attractive images of engagement and wedding rings (loose diamonds are also available at www.diamondfoundry.com). Partnerships with New York City retailers include Clay Pot Nolita (www.clay-pot.com) and Lori McLean Jewelry (www.lorimclean.com). Diamond Foundry made a splash at a 2017 Paris Fashion Week launch event, at which the company headlined the Fashion Tech Lab presentation. Over 400 fashion luminaries including representatives from Chanel Fine Jewelry, Balenciaga, Dior, Louis Vuitton, and Louboutin were in attendance. When it comes to engineered diamonds, some historic brands have been less enthusiastic. Companies like De Beers and Tiffany’s have cultivated their own iconic luxury brands under the notion that diamonds are rare, eternal, and exclusive. In fact, De Beers’s slogan, “a diamond is forever,” perpetuates the idea that the only acceptable option is mined diamonds. Initially published in 1845, the Tiffany Blue Book was the first collection of extraordinary jewelry available to newlyweds across the United States by mail-order catalog. Deemed “a rare beauty,” Tiffany yellow diamonds “make a glamorous statement for day or night.” Tiffany’s expertise in yellow diamonds dates back to 1878 when Charles Lewis Tiffany purchased the 287.42 carat Tiffany diamond. This rare specimen was then cut into a brilliant cushion-shape weighing in at 128.54 carats. Yellow diamonds continue to be a draw for the thousands of people who visit Tiffany’s flagship store in New York City every year. Noted as being “Ethical. Stunning. One-of-a-Kind,” Brilliant Earth allows users to shop diamonds by shape. Options include round, oval, cushion, princess, pear, emerald, marquise, asscher, radiant, and heart. From vivid blue sapphire to sparkling moissanite, Brilliant Earth’s selection of gemstone rings is sure to please. You can create your own individual ring by selecting a gemstone and pairing it with a setting of your choice. You can also shop by gemstone, with aquamarine, morganite, emerald, and sapphire being the particular standouts. Another noteworthy design is Zhang’s Grace Emerald Cut Engagement Ring, inspired by Grace Kelly’s iconic engagement ring. The Grace is a classic emerald cut featuring a slim band tapered by baguette diamonds flanking the center emerald cut diamond. 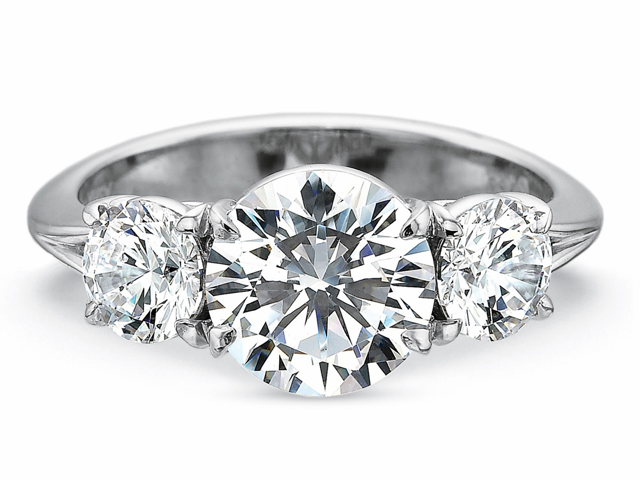 The ring can also be custom ordered with a different center stone of your choice. Does your bride have a theatrical flair? 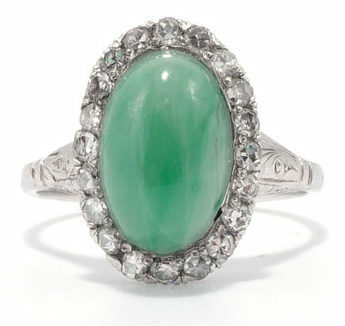 Then the Art Deco Jade Ring may be right for her. 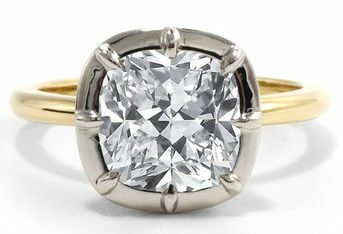 This stunning Art Deco-era ring is surrounded by a halo of subtly sparkly sing cut diamonds, set in platinum. The platinum shank is beautifully decorated with hand engraving. The ring is circa 1920 (www.ashleyzhangjewelry.com/vintage/art-deco-jade-ring). In 2019, it appears that brides and grooms can play by their own rulebook. This extends beyond the ring and the dress to coeds on each side of the aisle and mismatched attendant attire (because, why not?). Embracing colors and color trends for 2019 could also include a floral design inspired by the Pantone Color of the Year, Living Coral. Fresh palettes, pops of bold color, and eclectic stationery are all ways for the happy couple to express themselves. “Sociable and spirited” is how Pantone describes the juicy orange-golden shade on its website (www.pantone.com). This “animating and life-affirming hue” could easily be incorporated into a bouquet filled with poppies or a chuppah strung with chrysanthemum flowers in various shades of coral, yellow, orange, and pale pink. In short, there’s no end to the colorful 2019 wedding design trends.